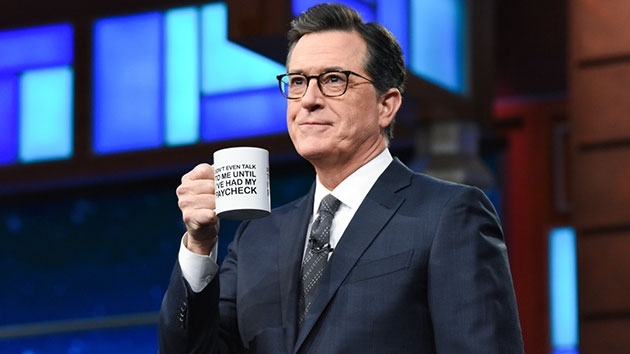 Colbert showed what he called a "shutdown coffee mug" emblazoned with the words "Don't even talk to me until I've had my paycheck," and then remarked, "Can we sell these?" (NEW YORK) — Buy a coffee mug, help feed a furloughed federal worker? That’s the deal host Stephen Colbert announced last night on “The Late Show.” He started by noting that celebrity chef José Andrés had opened a relief kitchen in Washington, D.C. to feed furloughed government workers, and anyone else in need of a meal, for free — to the tune of up to 200,000 meals a day. The mugs retail for $14.99 each, plus shipping.